The new Samsung Galaxy Note 4 offers a lot of new features and functions, including the one that offers users a modern way of taking notes. This feature is called Photo Note. With Photo Note, you can make your own notes, take photos and instantly convert analog to digital images. You can also use the S Pen to easily edit notes, change colors and insert more memos on your device. 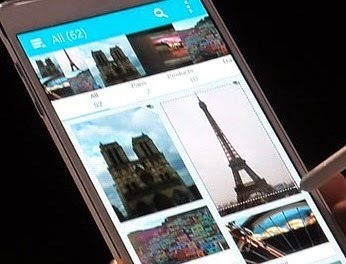 Here's a quick guide on how to use Photo Note on the Galaxy Note 4. You may start here whenever you're ready. 1. Tap Apps from the Home screen to get started. 2. Tap the S Note for Photo Note from the Apps screen. 3. Tap the Create new note icon (plus sign) located on the upper-right of the next screen. 4. Tap the Photo note icon located on top of the text editor in the next screen. 5. Now touch on image(s) to take. Capture image when you see the border around subject appears blue, for best results. The phone camera will then detect a rectangle shaped edge. 6. Change the detection mode from Manual to Auto (optional). To easily capture document, use Auto Mode or you can tap to switch to Manual mode for more precise editing. 7. When you see the edges have been correctly detected, tap the Camera button to capture selected image. 8. Edit your captured photo and/or manually adjust the detected edge area and rotate image direction. Tap the Save button when editing is complete. Doing so will save the recent changes you've made to the image. 9. Crop or stretch your captured image (optional). After stretching or cropping, Photo Note will detect text and images by different sections in your document automatically. You may also choose to apply or remove the Photo note effect on a selected photo. Using the Photo note effect, you can easily recognize text because the background color becomes white. If you don't want to apply the Photo note effect, your section will be copied and pasted as it is. 10. Remove/add sections to your documents. To add new sections, tap the Plus (+) button. New section will then be added, allowing you to change the section location to apply Photo note effect. By default, each section will be pasted into S Note as a separate image. To remove sections, simply tap the Close (x) button. 11. Tap the Save button, once the section is completed. When you insert captured photos in S Note, the background color and sections with Photo note effect become white, enhancing the readability of text. 12. Edit, cut, crop sections on S Note. You can cut, edit, or crop each sections on S Note by tapping and holding the section. The image section will be changed to white color if you tap and apply Convert to edit, to an image section on S Note. 13. After editing is complete, tap the Save button to apply all the recent changes you've made. And that covers the basics of the Galaxy Note 4 Photo Note.